The VIP lanes will create minor benefits for the people who use them while at the same time cause major headaches for the rest of London’s population. More than 200 taxi drivers have brought central London to a halt in a protest at the Olympic Games lanes. Blaring their horns, the cabbies took their case to Parliament Square, creating gridlock in the heart of the capital. with the jam swiftly spreading to Millbank and Whitehall. London’s iconic black cabs are being excluded from the 30 miles of games lanes, which have been reserved for Olympic competitors, officials and sponsors. Taxi cabs in central London. Photo by al3xadk1n5. Dubbed “Zil lanes” by critics, they come into force on Wednesday next week. Drivers who transgress face a £130 fine. The restrictions will ban drivers from the lanes, making journey times across the capital longer and dearer for passengers. Many cab drivers have said they will leave London during the Games rather than put up with the frustration of navigating the capital’s traffic. “There will be no access to these lanes for any traffic apart from the Olympics family. “Taxis are excluded, which is unacceptable and wrong. This is a working city and we need to get around and do our job,” said Jonathan Myers, of the United Cabbies group union. 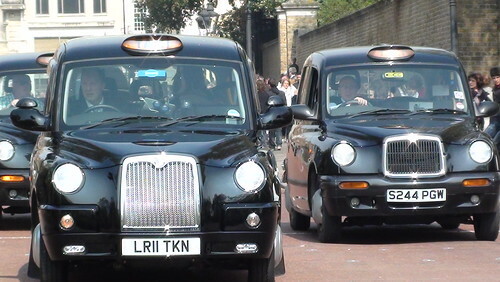 However John Mason, Director of London Taxi and Private Hire, defended the arrangement. “We have worked tirelessly with groups that represent the majority of hard working taxi drivers to provide cabbies with as much access to the lanes as possible. “Transport for London has secured concessions specifically for taxi drivers, including the use of turns along the Olympic Route Network that were initially banned for all traffic except buses, as well as access to a number of kerbside Games lanes to pick up passengers. “We have informed taxi drivers that any such demonstration is completely irresponsible and would only disrupt the travelling public – the very people taxi drivers are supposed to serve.